We’re baaaaack! On the boat again. 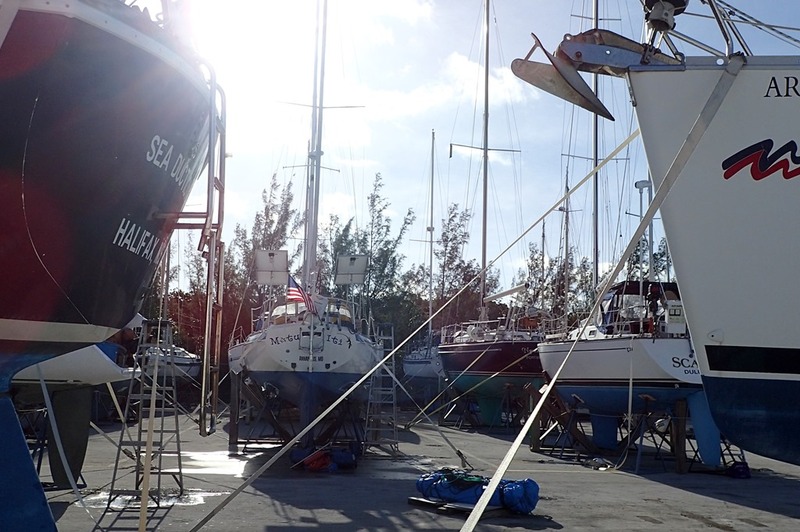 Motu Iti survived Hurricane Matthew – safe in its snug summer home at the Abaco Yacht Services yard in Black Sound. That’s in Green Turtle Cay, Abaco, Bahamas. 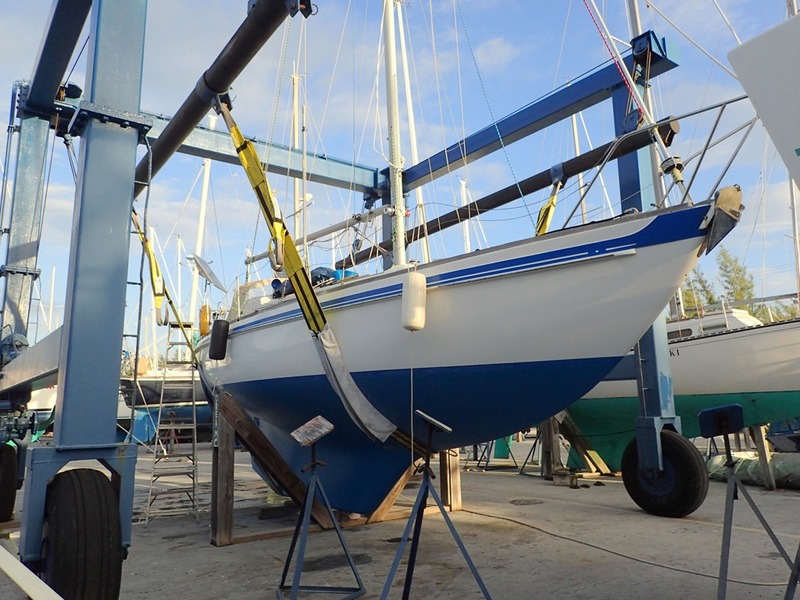 Goldwin arrived a week ago – our original schedule, and worked on some minor repairs and routine maintenance. I followed this past Monday after spending a magical week with my grandson and daughter while my daughter attended a conference near DC. Wow, is he an adorable, curious, playful, chatty, mobile, one-year-old Fun. My trip started with an early flight out of BWI. Lugging, as my carry-on, a duffel bag so full of chocolate and other goodies that I could hardly lift it. 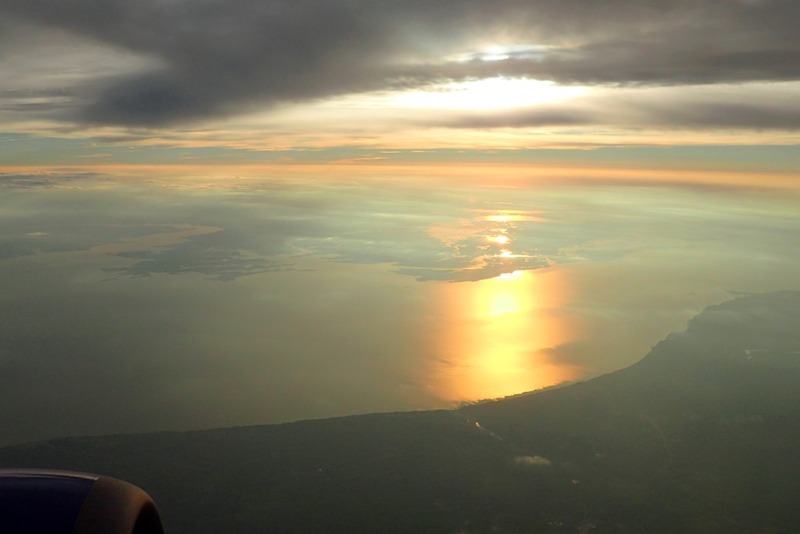 Finally we were airborne and I was watching the sun rise over the Chesapeake Bay. So happy to have snagged a window seat. 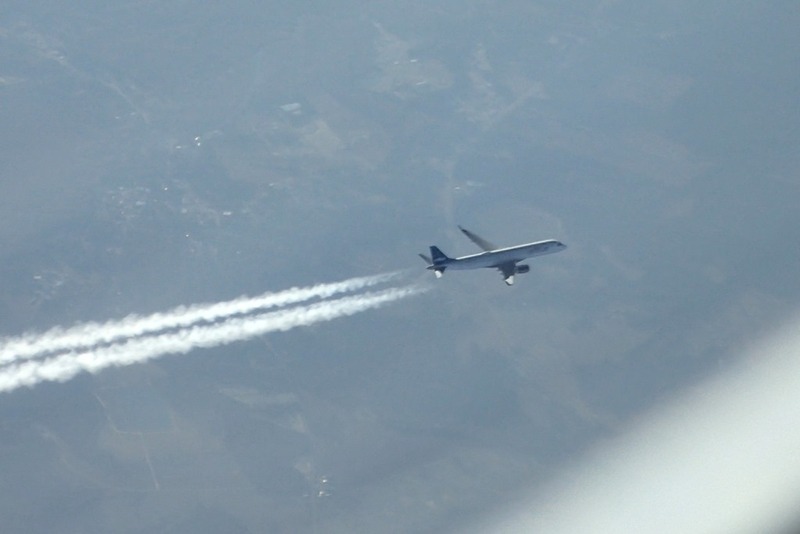 But here’s something you don’t really want to see from your plane. 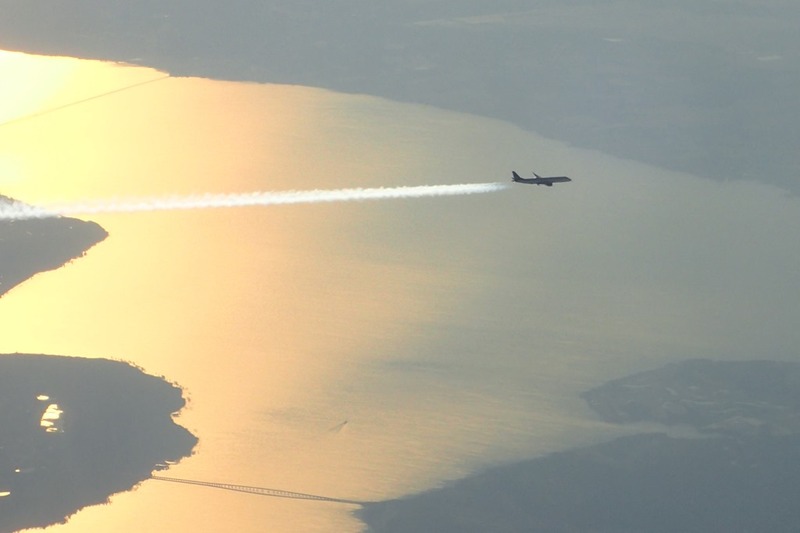 Another plane. 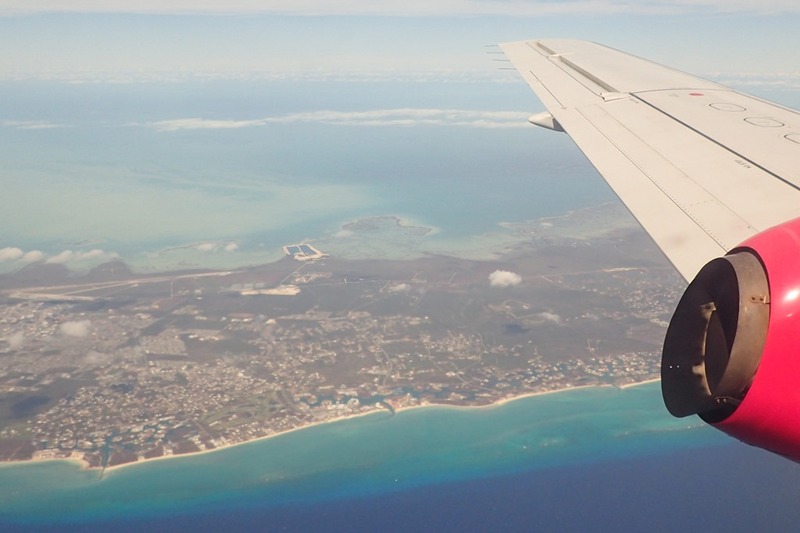 Soon I was on Silver Airways (only about 30 minutes late) and flying over Freeport, Bahamas, which took a direct hit from Hurricane Matthew. Next a taxi ride and then a ferry ride that dropped me off right at the boat yard. Where I was met by a smiling Goldwin. 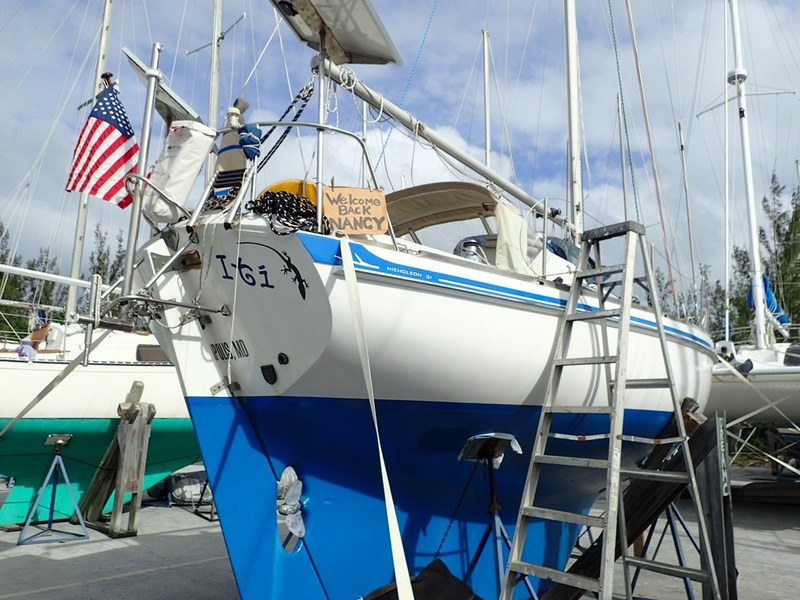 See the “Welcome Back Nancy” sign on the boat? This is what a very secure boat yard looks like. 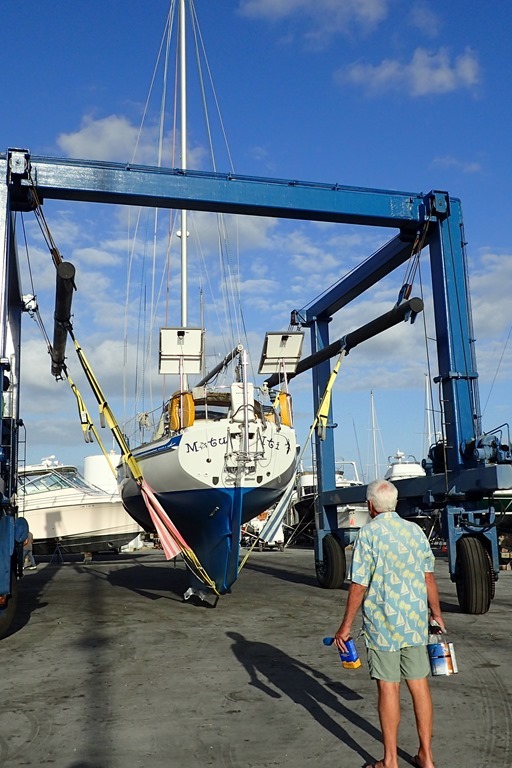 Note all the stanchions and wooden cradles and airplane-like tie-downs for each boat. To this in two days. We had no mildew and no bugs or other animals except one locker with teeny, tiny sugar ants. We stayed in a rental for a week during this clean-up, fix-up time. 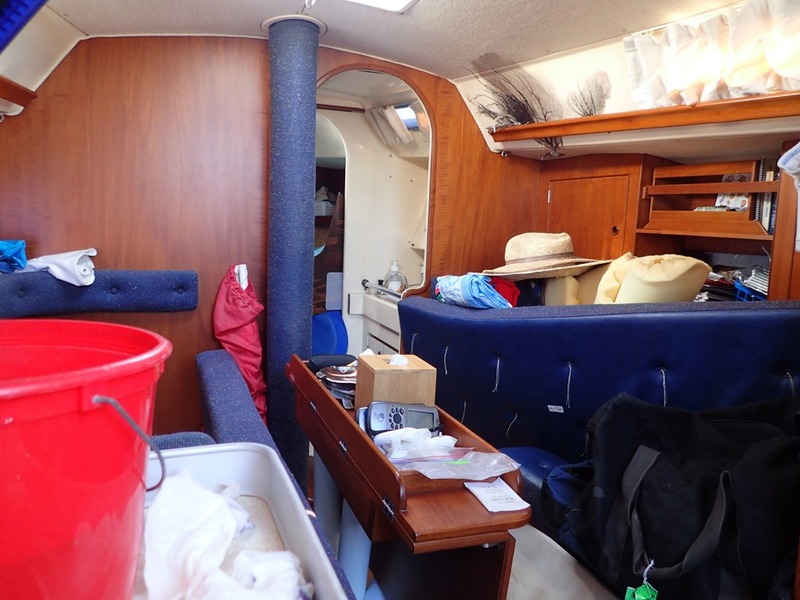 Hot showers every night – we were filthy, sweaty messes after working on the boat all day. Plus the mosquitos were ferocious. We walked the one mile to town for dinner one day, has a wonderful lunch on the Green Turtle Club’s beautiful veranda – stunning views of palm trees and water, whispering fans overhead, fresh halibut, lovely friends to share it all with – and finally borrowed a golf cart from generous friends to buy groceries. 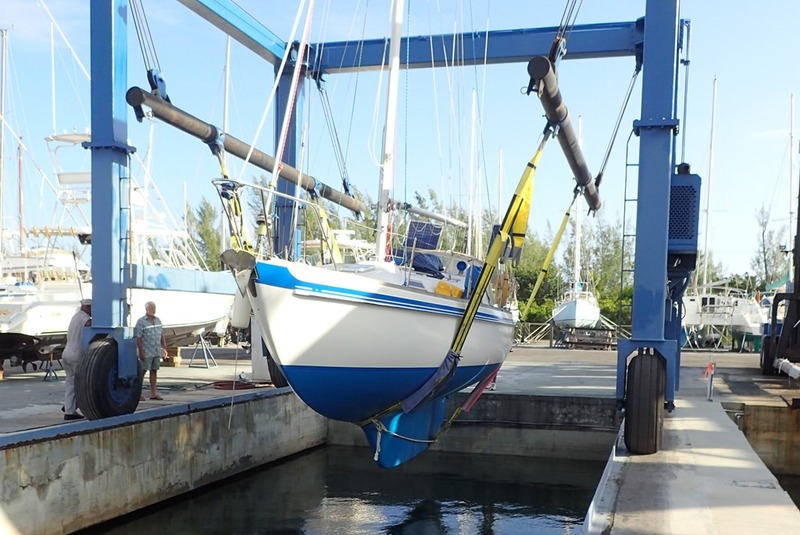 Motu Iti spent Tuesday night in the slings of the travel lift so we’d be ready to launch early Wednesday. Soon she was on her way to the service well. And down she went. Nice and easy. Today we’ll clean the decks and put on the sails. 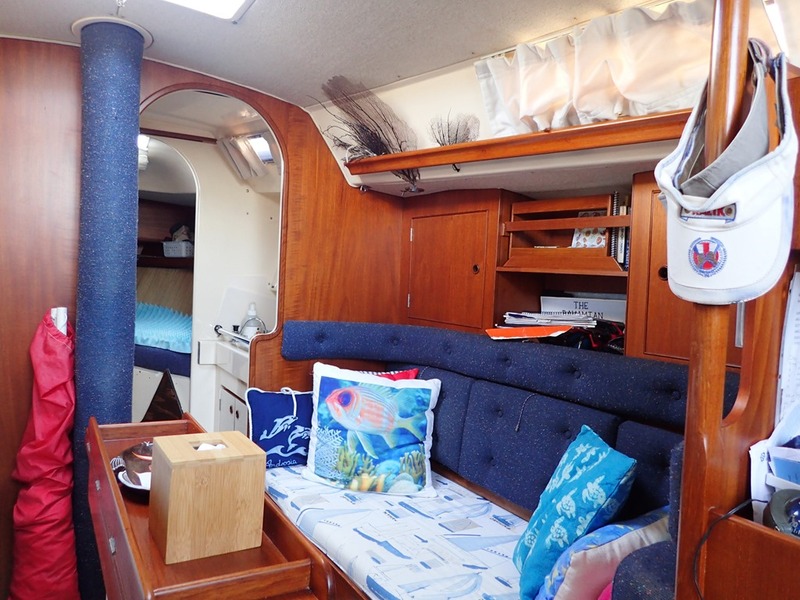 Then we’ll wait for the ocean to calm a bit so we can get through Whale Cay passage. Here is the beach on the ocean side. The so-called “Whale” is the passage out from the Sea of Abaco into the Atlantic Ocean around Whale Cay and then back into the Sea of Abaco. 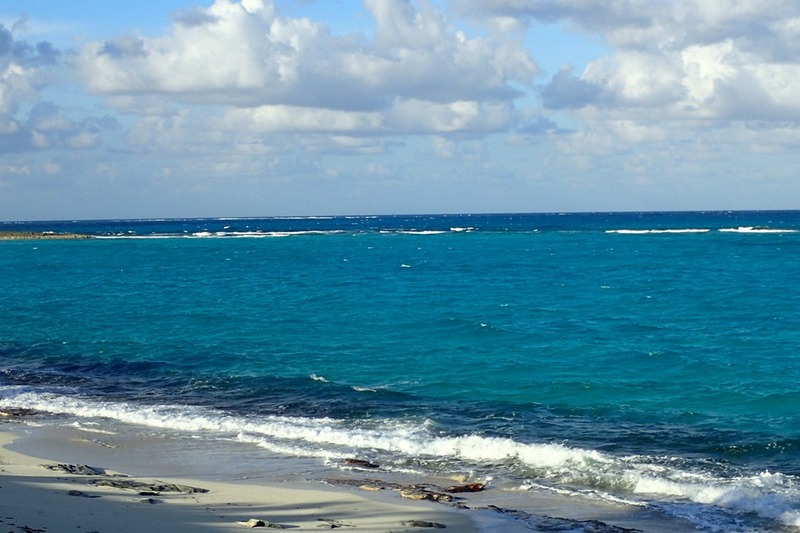 The tricky part is that when the ocean is especially riled up – the locals said the wind has been blowing about 30+ mph since Matthew hit – waves come through the narrow passages – into the Sea of Abaco – with a vengeance. After the wind calms down it takes a day or so before the waves relax. 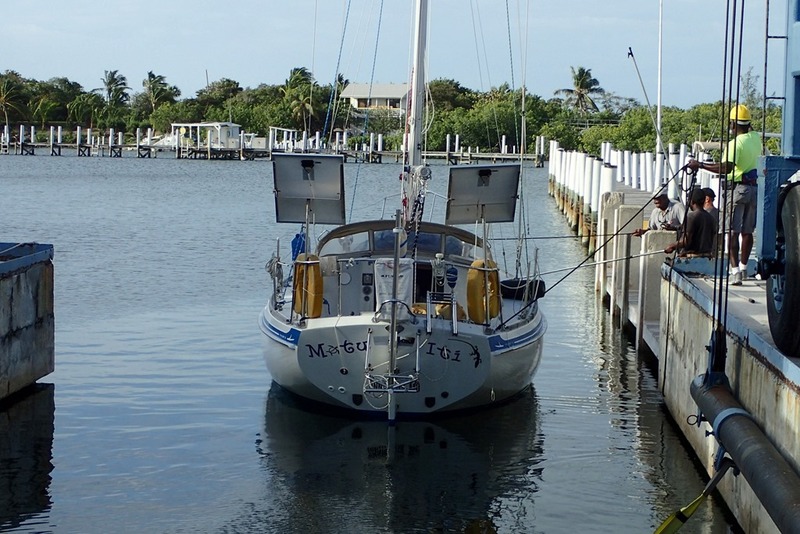 Once it seems safe, we’re off to HopeTown – about 30-35 miles. It’s great to be back on the boat, but we always have to adjust to the very different lifestyle and we always miss our family and friends. And we miss you. Glad you had such a great visit with your grandbaby in California. Safe sailing. So jealous. Keep posting . . .
Glad you are back again and the boat survived Matthew. We look forward to being entertained by your photos and comments. Glad to here from you. Looking forward to lots more warm stories as we prepare for winter in Michigan. Your adventures and your blog could not get any better! Loved every word and photo! Enjoy!